AvaCon Grid – AvaCon, Inc.
Visit AvaCon’s virtual headquarters in the metaverse on the AvaCon Grid! The AvaCon Grid runs on the OpenSimulator platform and includes conference center space, a sandbox area, and resources, with much more to come soon. If you are brand new to OpenSimulator, you can create a local account on the AvaCon Grid and log in directly. See below for instructions. 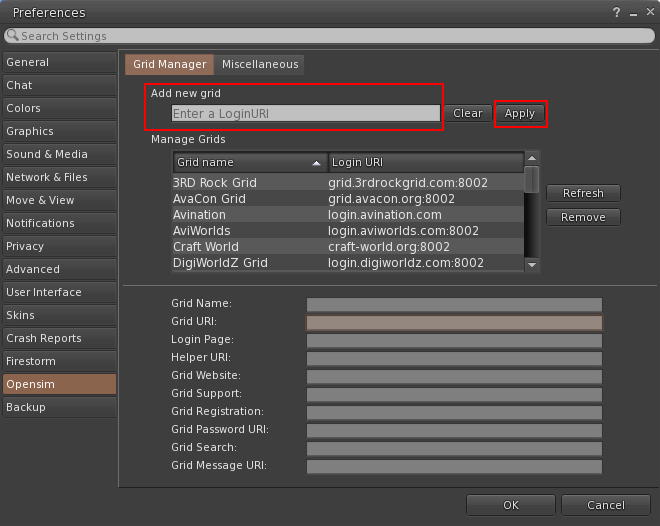 If you already have an OpenSimulator account that is Hypergrid enabled, you can Hypergrid jump to http://grid.avacon.org:8002. To log in directly with a local account, go to the AvaCon Grid Account Management Portal and click the “Create Account” link on the right side of the page. Enter the information requested and choose the default avatar type you prefer. Regarding your First and Last name, some use an online identity, while others use their real life First and Last name. It is up to you to choose which you prefer. Your account will need to be approved by an administrator, and you will receive a notice to the email address you provided when your account has been approved. In order to view webpages, you have to have a web browser like Chrome, Firefox, or Safari installed on your computer. Similarly, in order to visit the AvaCon Grid, you will need a Viewer installed on your computer. We recommend using the Firestorm viewer, and you can download and install the most recent version of this viewer on to your computer to access the AvaCon Grid. You will want to download the “For SL & Opensim 64bit” version. Or, if you prefer, you can download and install the latest version of the Singularity viewer. In addition, for the visually impaired, the Radegast viewer is a text-only viewer that is compatible with screen readers. Download and install the Radegast viewer, and you may wish to review the Radegast Accessibility Guide for the Blind and Visually Impaired compiled by Virtual Ability for more information about how to use the client with a screen reader. 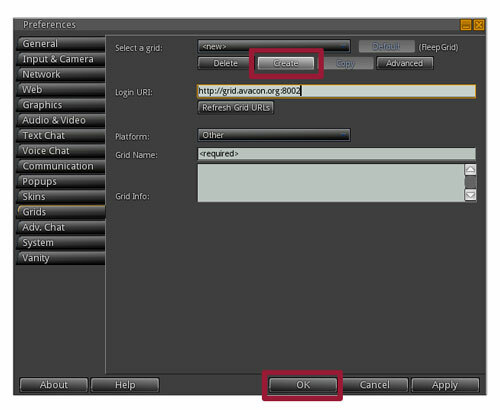 – In Preferences select the “OpenSim” tab. It is the second last tab. As soon as your account has been approved by an administrator, you should be able to log into the AvaCon Grid. – Select the AvaCon Grid from the pull down menu. 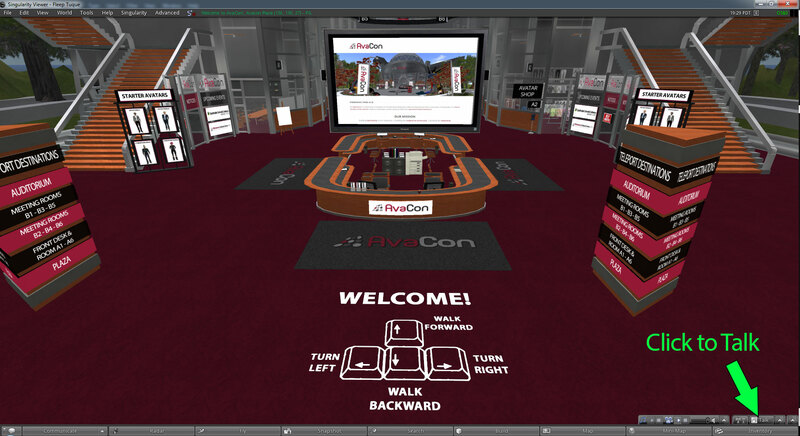 When you log in for the first time, you will be in the AvaCon Plaza region, in front of the reception desk. To speak with your headset/microphone, click the Talk button in the lower right corner of the screen. Internet Connection: High-speed Cable, DSL, or Fiber connection. Operating System: Windows, Mac, or Linux. Computer: Not more than 5 years old, preferably 3 or less, with at least 2GHz processor or better. Computer Memory: At least 4GB RAM. Graphics Card: Windows – NVIDIA GeForce 6600 or better, OR ATI Radeon 9500 or better, OR Intel 945 chipset. Mac – ATI Radeon 9200 and above, OR NVIDIA GeForce 2, GeForce 4. Linux – NVIDIA GeForce 6600, or better OR ATI Radeon 8500, 9250, or better. We also recommend a USB headset/microphone, preferably noise cancelling, that you can use to speak in voice. A microphone built into your computer, webcam, or laptop is NOT recommended, as having an “open” microphone can cause painful feedback loops and distortion for other users.